Antwerp / Web Gallery of Art. 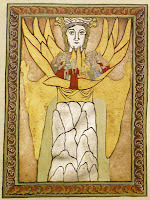 St. John, the “beloved disciple” of Jesus in his eponymous Gospel (John 21:20-24), held a unique place not only among the Twelve but also in Hildegard’s understanding of their shared virginal and visionary charism. 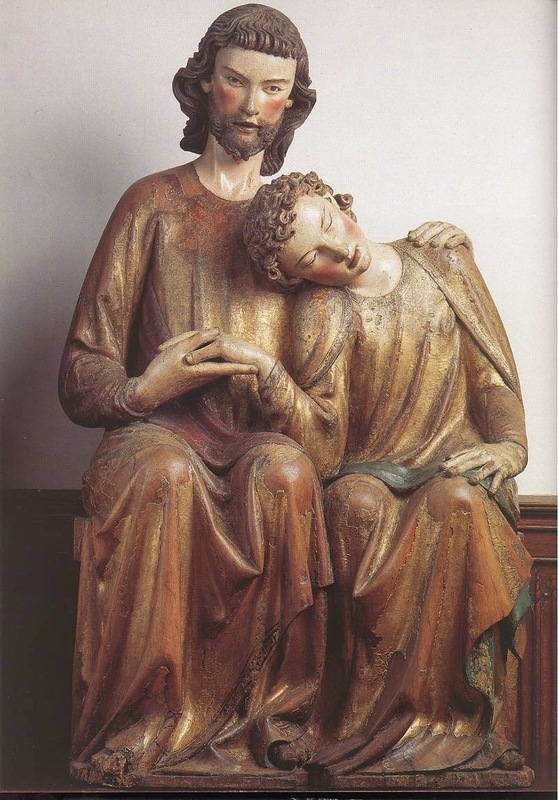 It was commonly accepted in the Middle Ages both that he was the same man as John of Patmos, the author of the Apocalypse; and that John’s particular gift was lifelong virginity, which marked him out for the special place “reclining nearest to Jesus” at the Last Supper (John 13:23) and as the Virgin Mary’s adoptive son beneath the beam of the Cross (John 19:26-7). In contrast to the bloody martyrdoms of the other eleven apostles, John’s martyrdom was the spiritual death of the desires of the flesh, marking him as the first representative of the monastic discipline of vowed virginity that came to receive the transferred crown of martyrdom in late antique and medieval Christianity. 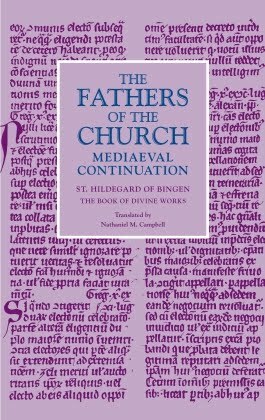 The focus of this antiphon is Hildegard’s praise for her comrade in virginity, expressed in three particular symbolic images that articulate the special contemplative gift afforded “the new posterity” of the Order of Virgins within the Church. The first of these—the speculum columbe—expresses the idea that, in imitating the purity of the simple white Dove, the virgin contemplative receives from the Holy Spirit the gift of gazing upon divine mysteries at their font and source, unimpeded by the cloudiness and shadows that plague the person still wedded to the desires of the flesh. The music in this first part of the antiphon works to emphasize that the more chaste one is, the more pure the contemplation will be, by repeating the same motif on the superlatives castissime and purissimo—a motif that itself reaches to the highest note in the piece. It was as if the inspiration of God were sprinkling drops of sweet rain into my soul’s knowing, the very same with which the Spirit instructed John the Evangelist when he drank in from the breast of Jesus the most profound of revelations. His sense at that time were so touched by the sacred Divinity that he revealed hidden mysteries and works, saying, “In the beginning was the Word…” (John 1:1), etc. The “drops of sweet rain” lead us appropriately into the second symbolic image for John’s virginity, of the flower. 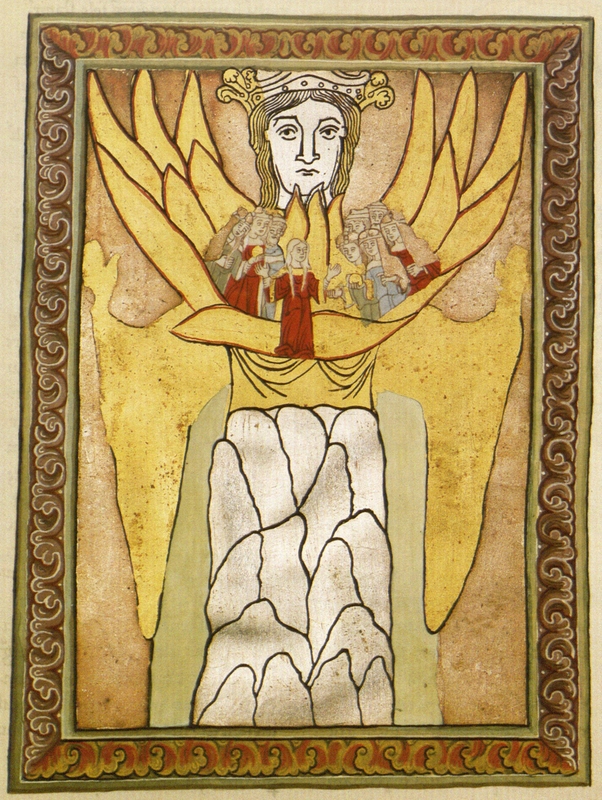 This was a common image in Hildegard’s pieces devoted to the Virgin Mary and her Son (see e.g. Hodie aperuit [Symphonia 13] or Ave generosa [Symphonia 17]), but she gives it a unique treatment here by invoking, not just a flower, but the very concept or idea of flowering (floriditas)—a state of perpetual, virginal flourishing that takes its root from its eternal planting by the arresting image of God the Gardener. This planting, however, is also the mission of a new and holy race. Thus, the final image of John’s virginity triangulates the contemplative’s mirrored vision and the flower’s fertile blooming with the sunlight that embraces both. 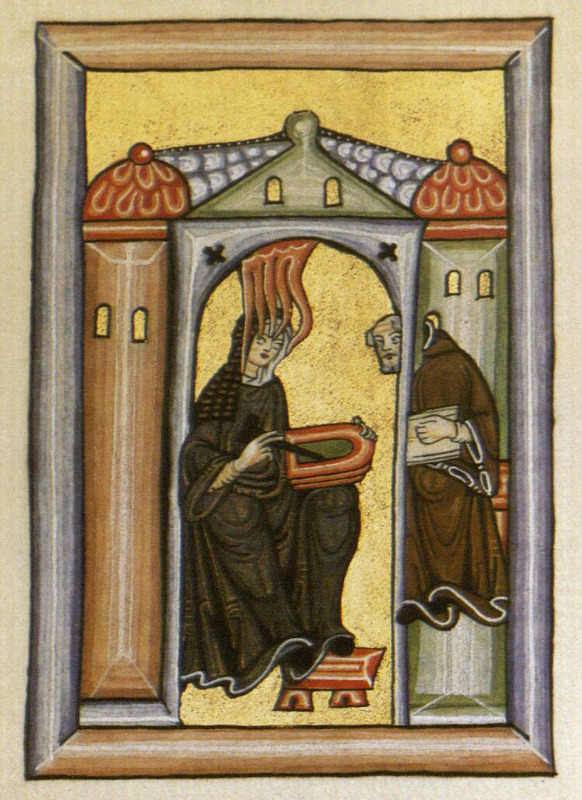 The warmth of this embrace echoes one of Hildegard’s frequent images to describe her own visionary experience of the Living Light (lux vivens) and its shadow, e.g. at the opening of Scivias: “Heaven was opened and a fiery light of exceeding brilliance came and permeated my whole brain, and inflamed my whole heart and my whole breast, not like a burning but like a warming flame, as the sun warms anything its rays touch.” This intimate embrace is that of the special friendship afforded to virgins as children of the Lamb, whose unblemished flesh they imitate so dearly. This is Virginity, innocent of all foulness of human lust. Her mind is unbound by any shackle of corruption (…). She is also, as is shown you in this hidden and supernal light, the noble daughter of the celestial Jerusalem, the glory and honor of those who have shed their blood for love of virginity or in radiant humility preserved their virginity for the sake of Christ and died sweetly in peace. For she was betrothed to the Son of Almighty God, the King of all, and bore Him a noble brood [nobilissimam prolem], the elect choir of virgins, when she was strengthened in the peace of the Church. “And they sang, as it were, a new song before the throne, and before the four living creatures and the ancients,” (Apoc./Rev. 14:3). What does this mean? In those faithful ones who embrace chastity for a good purpose and preserve their virginity unstained for love of God, good will bursts forth wonderfully in praise of their Creator. How? In the dawn-light of virginity, which always surrounds the Son of God, steadfast praise is hidden; no worldly office and no tie of the law can resist it, and it sings in the voice of exultation (Ps. 41:5) a celestial song to the glory of God. How? That song, which was not heard before the Only-Begotten of God, the true flower of virginity [verus flos virginitatis], returned in the body from earth to Heaven and sat again on the right hand of the Father, has a swift course and makes itself heard wonderfully in new liberty. (…) This new and unheard-of mystery resounded in Heaven in honor of virginity, before the majesty of God (for God could do this) and before the four wheels that rolled into the four corners of the earth bearing the truth of justice and the humanity of the Savior like the living creatures in the new Law, and before those ancients who were imbued with the Holy Spirit and showed the path of righteousness to the people under the old Law. This is beautiful, Nathan. Would you consider posting some of these Hildegard hymns with vocabulary and reading notes, for beginning Latin students like me?